The easiest ways to crank up the volume. If your locks are limp and your style is constantly falling flat, there’s no need to stress. We asked Becca Panos, a stylist at Maxine Salon in Chicago, to share her best tips and tricks for making your hair look fuller, fast. There’s clearly no shortage of products that claim to give you the most voluminous hair ever, but not all are created equal. As a general rule, airy formulas such as aerosols, sprays, and mousses are lighter and a better bet than creams or gels, particularly if your hair is fine or limp to begin with. Still, be careful not to overdo it: “Using too much product can weigh down the hair and make it fall flat,” she cautions. Extensions aren’t just for extra length. 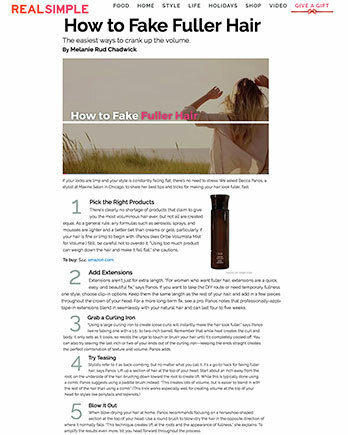 “For women who want fuller hair, extensions are a quick, easy, and beautiful fix,” says Panos. If you want to take the DIY route or need temporary fullness for one style, choose clip-in options. Keep them the same length as the rest of your hair, and add in a few pieces throughout the crown of your head. For a more long-term fix, see a pro. Panos notes that professionally-applied tape-in extensions blend in seamlessly with your natural hair and can last four to five weeks. “Using a large curling iron to create loose curls will instantly make the hair look fuller,” says Panos (we’re talking one with a 1.5- to two-inch barrel). Remember that while heat creates the curl and body, it only sets as it cools, so resists the urge to touch or brush your hair until it’s completely cooled off. You can also try leaving the last inch or two of your ends out of the curling iron—keeping the ends straight creates the perfect combination of texture and volume, Panos adds. When blow-drying your hair at home, Panos recommends focusing on a horseshoe-shaped section at the top of your head. Use a round brush to blow-dry the hair in the opposite direction of where it normally falls. “This technique creates lift at the roots and the appearance of fullness,” she explains. To amplify the results even more, tilt you head forward throughout the process.